Amping up the visual appeal of your space and making it more comfortable is only possible if you pay attention to small details. Designing your rooms in such a way that you can add a modern twist to them requires you to have a ceaseless enthusiasm to identify what kind of statement pieces can liven up the appearance of your home. Any item that you have in your room must be capable of justifying its purpose and functionality. You shouldn’t be placing any furniture piece in your home without thinking. Just because a furniture piece looks too stunning doesn’t mean it deserves a place in your home. In essence, identifying what kind of furniture works for you remains highly important when it comes to designing functional and comfy spaces. Whether you have a small house or a big villa, every house deserves a couple of occasional furniture pieces to transform it into a home. Buying a house is easy but converting it into a beautiful home is what requires your efforts and energy. Occasional furniture pieces help in elevating the comfort and glamour quotients of your abode because these are the pieces that remove the burden from your shoulders when it comes to making it easier for your guests and loved ones to feel comfortable. So, if you are looking forward to making your house more elegant and comfortable, invest your money wisely in occasional furniture. Refresh the look of your living room by adding a center table with a dark wood tone that can amp up entire look and feel of your space. While ordering occasional furniture pieces like a cocktail table, all you have to keep in mind is that they should have the potential to complement the color of other statement pieces such a sofa set accommodated in your space. For example, you can’t make the mistake of ordering a cocktail table that doesn’t go well your sofa because that can degrade the visual appeal of your space. Generally, cocktail tables with dark wood tones always look great in living rooms because they go well with all kinds of furniture. Therefore, you do not have to be too conscious while ordering them. Considering the size of your room remains one of the essential things while buying a cocktail table for your abode. Make sure, that there must remain sufficient space between your sofa and table so that people can walk comfortably. It should not stop your guests and loved ones from walking freely in the room. Whether you talk about living room decor or bedroom decor, end tables are always welcomed. They are not only important for livening up the look and feel of your space but they are equally crucial for providing more comfort to people. 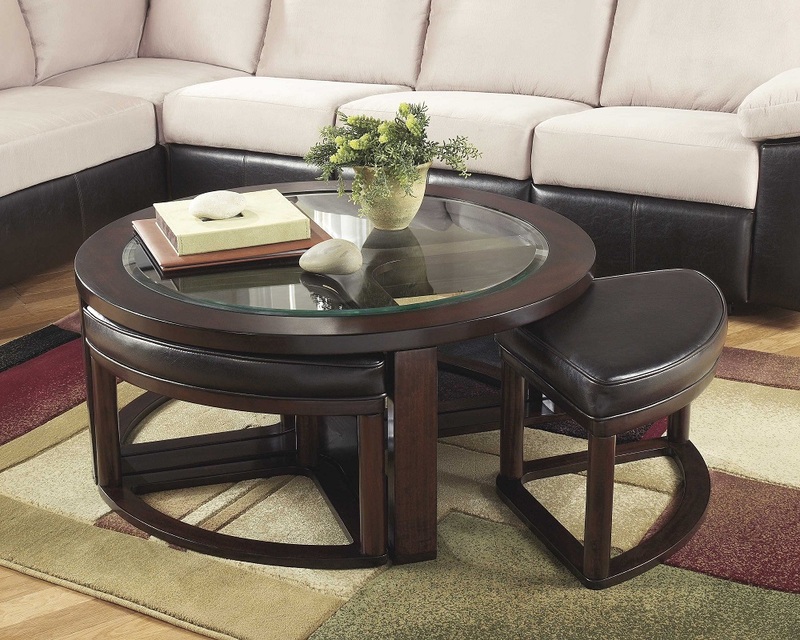 For example, you can easily improve the elegance of your living room by placing an end table right next to your couch. You can place several things on them while using your sofa, for example, if you are enjoying your coffee, you can keep your cup on it once you are done. Similarly, if you are reading a book, and feel like taking some rest you can place that book on the end-table that lay right next to your couch. In addition to that, you can also place night lamps and other decorative items on them to make your room look more appealing. TV stand remains an integral part of the occasional furniture and you can use it for storing a wide range of items apart from housing your TV on it. If you want to bring unique hues and textures in your space, you can use it for the same, because they are available in an array of gorgeous tones. Again, you have to pay attention to the fact that it must be capable of complimenting other crucial items placed in your room. If you are a bookworm, a stunning bookshelf definitely deserves some space in your house. There must be a proper place for books in your house, otherwise, they will make your space look cluttered. It’s completely true that, when you fail to have a bookshelf in your home, you will end up keeping your books here and there, which will ruin the beauty of your space. So, make sure that you have a perfect place for your books in your house. A chest of drawers remains an important part of both living room and bedroom decorations. You can use it for multiple purposes and it also helps in adding a magical charm to your space. You can use it for storing a variety of things such as your accessories, phones, books, and important documents etc. Last but not the least, no matter kind of furniture you have in your abode it must be characterized by minimalism and simplicity.